Christine Lucas (Nicole Kidman) wakes up every day thinking that she’s 15 years younger than her actual age. She doesn’t recognize the man lying next to her. The 40-year-old in the mirror doesn’t look right. She’s not even sure where she is. Not unlike Guy Pearce’s memorable lead in “Memento,” Christine has psychogenic amnesia. She was in a car accident over a decade ago. Since that day, she has rebooted after every night’s sleep. She doesn’t remember anything that happened the day before, and only gets occasional flashes of memory of the past 14 years. Her husband Ben (Colin Firth) has to go through the same routine every morning, helped by photos on the bathroom wall with Post-Its like “Ben, Your Husband.” Each day, Ben explains Christine’s predicament to her, as he goes to work and she sits around the house, waiting for the next night’s restart button. From the very beginning of “Before I Go to Sleep,” this premise feels faulty, at best. As directed by Rowan Joffe (“Brighton Rock”), the opening scenes make it clear that this is not a film with actual characters or relatable people within it. There’s no exhaustion in Ben’s voice, as there would be having done this routine every single day. Everything about the moment reeks of manipulative set-up instead of something real, and that feeling that you’re being as played with as Christine herself. 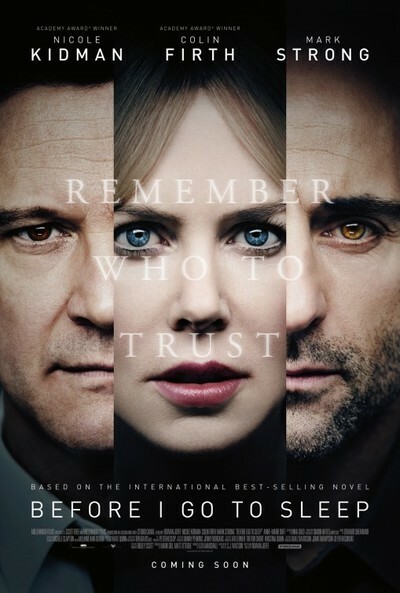 “Before I Go to Sleep” is a movie with nothing to hold on to but a paper-thin mystery with really only one of two possible suspects in the end. As you can guess, there’s more to Christine’s story than Ben’s initial explanation. After her husband leaves for work, she gets a call from Dr. Nasch (Mark Strong), a neuropsychologist who has been working with her for the past few weeks. He tells her to find the digital camera in the back of her wardrobe. She’s been recording revelations every day, reminding herself of what she’s discovered about Ben, her “accident” and more. She hasn’t lost her memory from a car accident. She was brutally attacked. By whom? Why? And what else is Ben keeping from her? How much could you trust someone who you think is a stranger even if he tells you he’s not? Of course, every question in a film like this has an answer. It’s a screenwriting exercise more than a film. It’s hollow, the kind of quick beach read that could satisfy on a summer vacation (and was based on such a book) but Joffe hasn’t justified transitioning it to the big screen. There’s no edge, no pulp, no grit under its fingernails. Part of the problem is that Joffe seems bored by his own material. “Before I Go to Sleep” needed to be stylish to play like a classic thriller or edgy to replicate the sense of confusion inherent in Christine’s situation. It’s neither. The film is visually flat, disappointingly shot mostly in boring close-ups as one of the three central actors explains what’s happening now. And Joffe and his team try to increase the film’s intensity with boring, cheap sound design, with multiple occasions of trucks that barely miss Christine as she’s crossing the street or quick cuts to a loud, overhead plane. It’s supposed to be unsettling. It’s just cheap. Partially by virtue of its piling-up revelations and dual suspect structure (only Ben or Dr. Nasch could be the “bad guy” since there’s no one else in the movie that seems to matter, especially not a character named Claire who really could have been named Plot Device), “Before I Go to Sleep” is a film that’s constantly explaining itself to you. Here’s what Christine knows now. Here’s the latest revelation. Here’s how she feels about it. Every scene is designed to push you to a new revelation. Honestly, I longed for just one scene of everyday life in Christine’s existence to add an ounce of realism to the production. It’s a film with no characters. To be fair, the fact that Kidman gets this much honest emotion out of this script is a testament to her skill level. With a lesser actress, the result would be even more disingenuous. She gives it her all. The movie just gives nothing back to her.